Air Georgian Limited (AGL) (Air Canada Express) (Toronto-Pearson) has signed a memorandum of understanding (MOU) with Regional 1 Airlines (R1) (Calgary), a subsidiary of Avmax Group Inc., a fully integrated aviation company with operations in Canada, United States, Africa and Afghanistan. Regional 1 Airlines and Air Georgian Limited will merge operations under one management team through the creation of a parent holding company. Air Georgian will continue to focus primarily on its CPA relationship with Air Canada (Montreal). Air Georgian currently operates Beechcraft (Raytheon) 1900D aircraft under the brand name of Air Canada Express. R1 will focus on expanding its domestic presence, specializing in serving the natural resource sector. R1 will further expand upon its existing international operations, specializing in ACMI contracts in remote regions, as well as continuing to support the United Nations World Food Program and other peacekeeping and humanitarian programs. This strategic merger will allow the new combined entity to position itself as a unique, fully integrated airline leveraging the technical, geographical and asset strengths of Avmax and the professional management and strong operational background of Air Georgian. Air Georgian and Regional 1 Airlines will benefit from having access to the world’s largest private fleet of Dash 8 and CRJ series aircraft, over $100 million in spare parts and domestic maintenance bases in Halifax, Montreal, Kingston, Toronto, Calgary and Vancouver. International operations will be supported through Avmax maintenance bases in Great Falls, Montana, Jacksonville, Florida, Nairobi, Kenya and N’djamena, Chad in Africa. Eric Edmondson will assume the President and CEO role at the newly formed parent company, as well as the role of President at both Air Georgian and Regional 1 Airlines. Daniel Revell will continue to be the CEO of Air Georgian and John Binder will continue in his role as CEO of Regional 1 Airlines. Scott Monsen will become the CFO & VP Finance at the parent company and its subsidiaries. Daniel Bockner will be the VP, Flight Operations & Security, while Brad Warren will fill the role of VP, Maintenance & Technical. Rick Giacomuzzi will hold the position of VP, Finance at Regional 1 Airlines. This merger does not impact the current structure or operations of any other subsidiary within AvMax Group Inc. Upon closing, the combined operations will utilize Beechcraft 1900D, de Havilland Canada (Bombardier) DHC-8-100, DHC-8-300 and CRJ100/200 aircraft types, with the ability to quickly add additional larger gauge aircraft types with the long term goal of positioning the brands as major players in the 18-76 seat turbo-prop and jet market. Air Georgian will continue to operate, maintain and support the corporate jet charter market in Toronto as well as offering third-party training to the airline and corporate aviation sectors. Copyright Photo: TMK Photography/AirlinersGallery.com. Beechcraft (Raytheon) 1900D C-GORA (msn UE-326) taxies at the Toronto (Pearson) hub in the Air Canada Express livery. 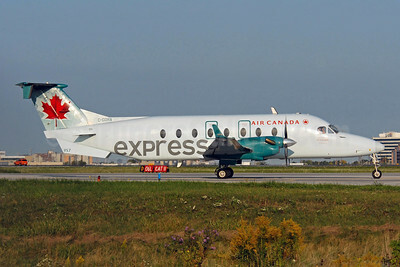 This entry was posted in Air Canada Express, Air Georgian, Regional 1 Airlines and tagged 1900, 1900D, Air Canada Express, Air Georgian, aviation, Beech, Beech 1900, Beech 1900D, Beechcraft, Beechcraft 1900, Beechcraft 1900D, C-GORA, Pearson, Raytheon 1900, Raytheon 1900D, Regional 1 Airlines, Toronto, transportation, UE-326, YYZ on September 12, 2013 by Bruce Drum.